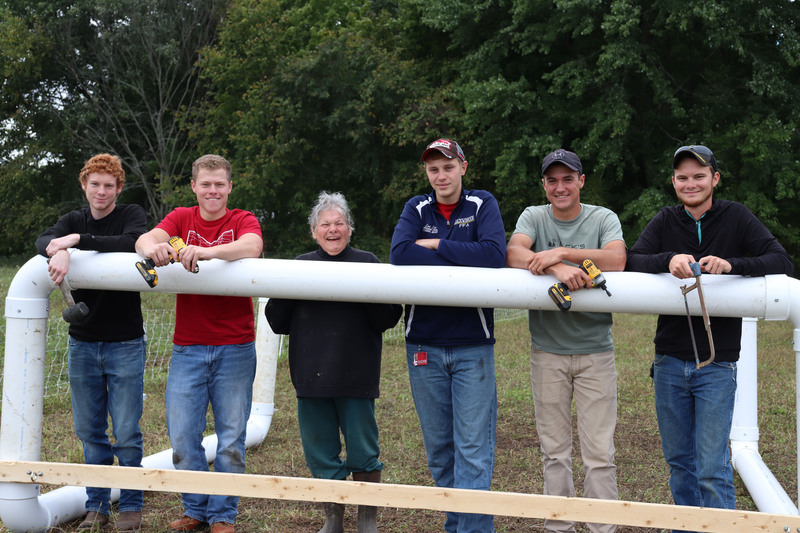 On a crisp Sunday morning in mid-September, 11 members of The Ohio State University’s Agricultural Systems Management (ASM) Club drove in a caravan down a rough one-lane road in Morrow County. They weren’t going to a club meeting. Instead they were on their way to help a farm couple whom they had never met before. Standing under the eaves of a cobweb-covered barn, 57-year-old Clarence Atkinson and 67-year-old Deborah Mattix anxiously waited for their visitors. They own BaaLiss Grass Farm in Fredericktown, Ohio, where they raise Irish Dexter cattle, Katahdin sheep and heritage Buckeye chickens. They sell their organic, grass-fed and free-range products at farmers markets, providing healthy chemical-free food to their customers. In order to keep up with demand, however, they really needed a helping hand. 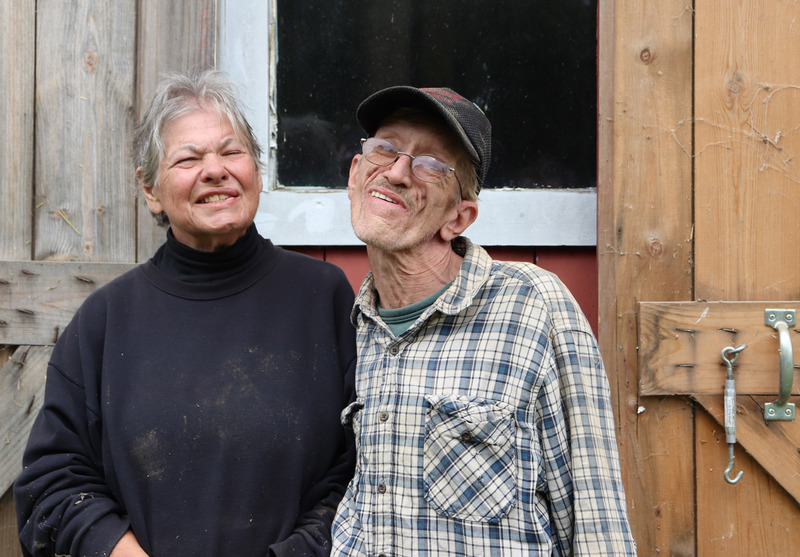 Deborah Mattix and Clarence Atkinson own and operate BaaLiss Farm in Morrow County. That’s where the ASM Club members came in. Atkinson, a former dairy farmer and the second generation to operate his family farm, has congenital myasthenic syndrome (CMS). A rare genetic disorder, it impacts the connection between nerve and muscle cells. According to the National Institutes of Health, CMS is characterized by muscle weakness that worsens with physical exertion. “I can’t move very well. This year has been worse than past ones,” Atkinson explained while pushing on his right hip to stay upright. His physical disabilities have made farm work even more difficult and hazardous than it already is. Mattix was fussing over bottled water and some bananas when the ASM Club members walked up. She dropped the hammer she was holding and showed them her plans for a new sheep shelter while bringing out a tool box. The chores that awaited the ASM Club members were simple and seemingly unimportant. “I just wanted to know how we were going to help,” said club member Ross Schroder, 21, of Leipsic, Ohio. The ASM Club churned out results and completed projects faster than Mattix could keep up. She trudged through the mud in her crusted boots, trying to find more for the group to help with, but couldn’t make a list fast enough. Former dairy farmer Clarence Atkinson watches as ASM Club members work on his tractor. 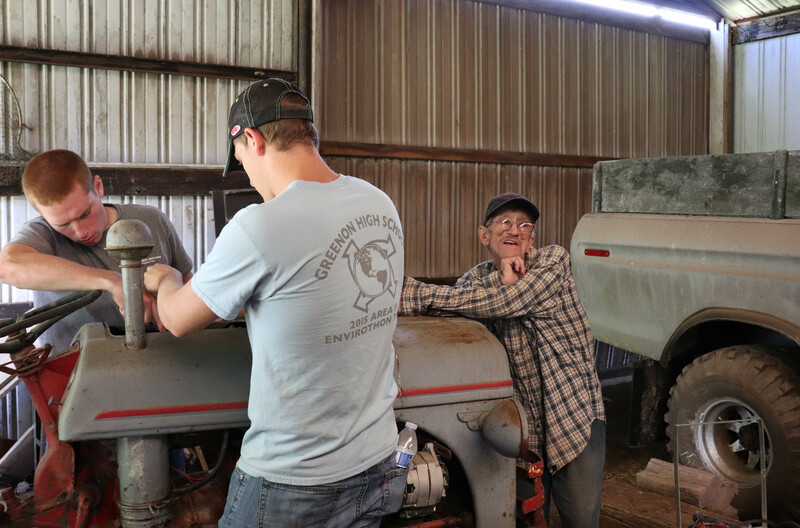 Club members joked and laughed with the farmers while changing the oil in a tractor, pulling a rusted battery out of another tractor, cutting down small trees and filling groundhog holes. The work was easy for the Ohio State students, but to the farm couple, it was several weeks' worth of duties that would have ended up being pushed aside for more pressing tasks. Atkinson’s face was tired, drooping at the corners of his mouth, but still held a smile and he always had something witty to say. 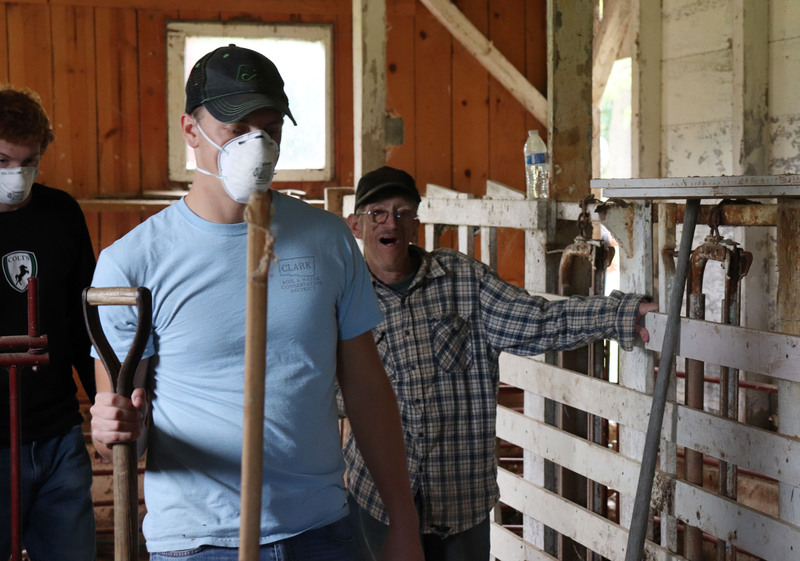 Speaking for the group, ASM Club member Forrest Lang, 20, of Wooster, Ohio, said, “We are out here helping the agricultural community, helping somebody who is not able to completely pursue the passion he has had his whole life due to being disabled." After lunch, a patch of trees was sawed down, a panel of fence was replaced and a hay elevator was relocated. The hay elevator was too large and heavy for Mattix or Atkinson to move without equipment, but the 11 club members pushed, and some rode, the elevator the short distance it needed to travel to the barn. ASM Club members teamed up to push a hay elevator from a field to a barn. According to the U.S. Department of Agriculture, there may be between 1 million and 2 million individuals in the agricultural industry with some kind of physical disability. It is also estimated that 200,000 farmers develop some kind of disability each year. These disabilities can make chores and basic farm tasks a challenge — sometimes even impossible. USDA recognizes this and is working to improve opportunities and conditions for farmers with individualized needs. These needs can be as simple as a special handle for a shovel or as complex as a lift to get onto a tractor. The issues these farmers encounter every day are daunting, but the possibilities for improvement are limitless thanks to programs like AgrAbility. The National AgrAbility Project is based at Purdue University. 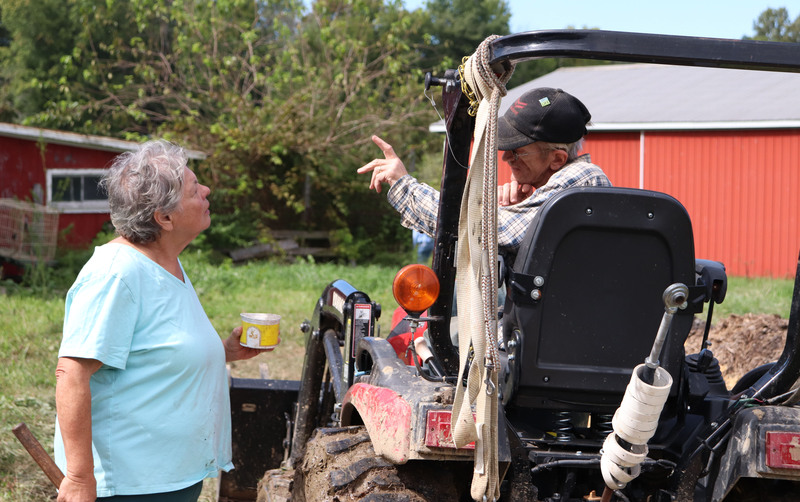 In the Buckeye State, Ohio AgrAbility is provided through OSU Extension in partnership with Easterseals serving Greater Cincinnati. OSU Extension is the outreach arm of Ohio State's College of Food, Agricultural, and Environmental Sciences (CFAES). 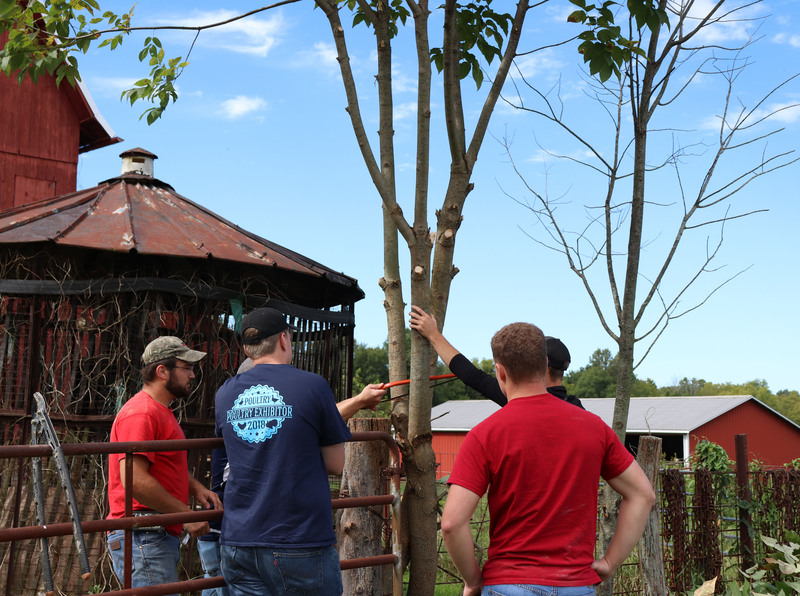 ASM majors worked to trim several trees on the farm. 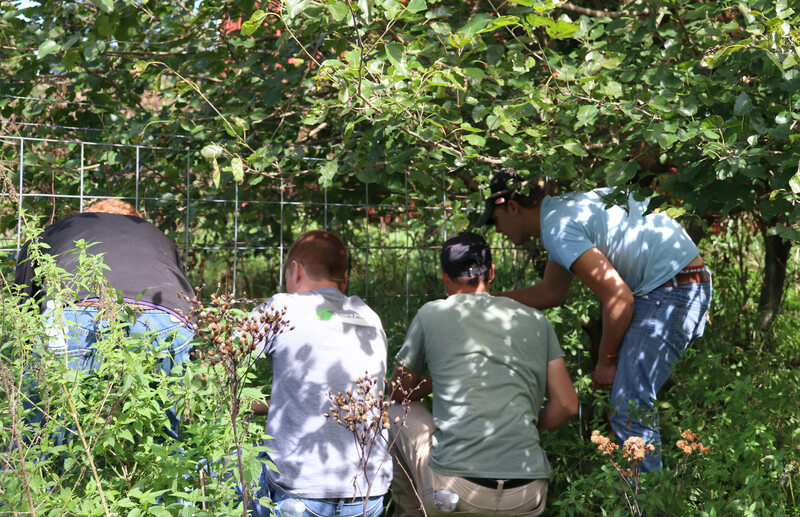 Through the program, OSU Extension specialists help with various projects, develop close relationships with farm clients and work to make a positive impact on those who need help. At Ohio State, Laura Akgerman works as the disability services coordinator for CFAES and coordinated the connection between Atkinson, Mattix and the ASM Club. Akgerman said she is proud of the club’s visit to BaaLiss Farm. (l-r) Broderick Ball and Chris Baird work to fill holes in the barn with concrete while Atkinson supervises. For the 40-member ASM Club, the hope is that the September visit will be the first of many. “This is a special chance to give back to the agricultural community. We just want to help and this is an awesome way to do that,” said club member and Amherst, Ohio native Brandon Palmer. Palmer, 20, is the club’s first elected community service officer. Through the years, the club has shifted the structure of this position many times, but always with the same goal: to help people in agriculture. Club adviser Dewey Mann, a lecturer in CFAES’s Department of Food, Agricultural and Biological Engineering, agreed. Mattix and Atkinson are a supportive and hard-working team on their 50-acre farm. When Atkinson and Mattix were together, the love they felt for each other was palpable. Every supportive hand, well-timed offer of water and check-up was in interest of helping each other. He would make her laugh and she would hold his arm through the more treacherous parts of the field. The care they felt was only bolstered by the group of ASM Club members providing a brief respite from responsibilities. Eventually, the clouds of sawdust, hay chaff, dirt and cobwebs settled, leaving behind a farm that was safer than it was found. There were no more large holes to break an ankle in, loose pieces of wire laying around or trees that blocked a path. Instead, all that was left were a few pizza crusts, a new sheep shelter and cleaner, more efficient equipment. At the end of the warm afternoon, everyone gathered outside of the barn, next to the newly placed hay elevator, while Atkinson and Mattix thanked the everyone profusely. “We can’t describe how much this means to us,” Mattix said. The farmers conferred for a moment and asked if there was any way they could repay the students and show their gratitude. The debt was quickly settled with handshakes, hugs and leftover bananas as the group loaded back up for the return trip to Columbus. ASM Club members removed a fence panel that was entangled in brush. 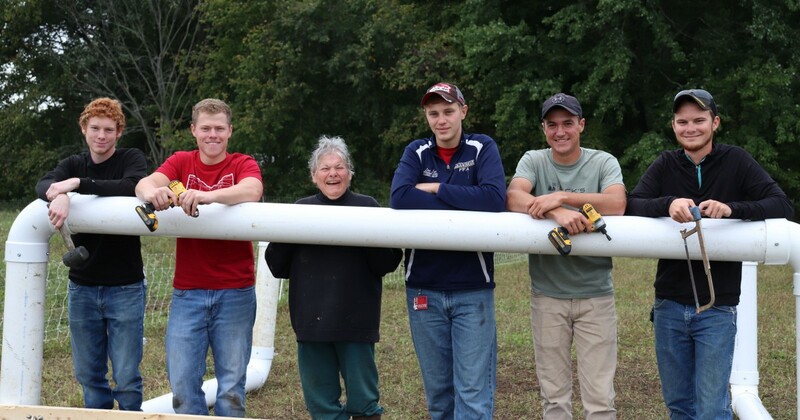 Farmer Deb Mattix (center) with the group who constructed a new sheep shelter: (l-r) Broderick Ball, James Fulton, Levi Lynch, Andrew McCord and Brandon Palmer. Levi Lynch (l) and Chris Baird prepare to trim a tree. ASM Club members listen as Clarence Atkinson shares some of his challenges. A satisfied group at the end of a long and productive day.